The supermarket is one of the 20th Century’s most important marketing innovations. The concept of the supermarket emerged in the 1930s, and supermarkets came to dominate food retailing in the two decades immediately after World War II. Made possible by rapid suburbanization of American cities and expansion of ownership of automobiles and refrigerators, supermarkets transformed business processes and competition for customers at the retail level. They also fostered expansion and new efficiencies for wholesalers and created new opportunities for food manufacturers to develop products for mass audiences. The basic hub and spoke distribution system that has evolved for supermarkets is built around large distribution centers located near interstate highways. These distribution centers receive full semi-trailer loads of product from suppliers and then send full semi-trailers out to individual stores daily or several times per week. Loads sent to stores are comprised of relatively small quantities of thousands of individual SKUs, or stock keeping units, needed to replenish the inventory of tens of thousands of SKUs stored on self-service shelves in a typical store. This system, which is supplemented by deliveries from specialty distributors and direct store deliveries by some suppliers, economizes on transportation and labor. With electronic transmission of orders and payment and computer-based tools that assist with ordering, pricing, and inventory management, this distribution system also keeps transaction costs to a minimum. It is ideally suited for sourcing consistent quality products at low cost from wherever they are available and so has been an integral part of an increasingly national and global food system. This mainstream supermarket distribution system favors large scale suppliers and facilitates long distance movement of products. Supermarket wholesale and retail companies usually prefer to work with a small number of large, reliable suppliers. At the same time, this system is remarkably resilient and quick to adapt. Can it be an effective channel for meeting the rapidly growing demand for local food products? Are there meaningful, long run prospects for a significant “relocalization” of supermarket offerings? While definitive answers to these questions are not yet apparent, there is emerging evidence that helps clarify how the relationship between the local foods movement and the supermarket industry may evolve. Local foods are defined, first and foremost, by their place of production, but other attributes also shape consumers’ perceptions of local food products. These can include production methods, as well as the size and local ownership of the farms that supply the product. For many consumers, a sense of direct linkage to the producer and a desire to support the local economy are also important. This sense of connection can be difficult to maintain when a product moves to the consumer through wholesale and retail intermediaries in mainstream supermarket channels. Branding is, of course, one common solution to this problem of transmitting information about product attributes through an intermediated distribution system. The mainstream supermarket distribution system can be as effective in delivering products and product information for local brands as it is for national or international brands. Two local products in Minnesota serve as excellent examples. Cedar Summit Farm produces and processes organic milk and dairy products from grass-fed cows. Owned by Dave and Florence Minar and operated with several family members, Cedar Summit’s marketing information stresses that “The Minar family at Cedar Summit wants to be your farmer.” They have been remarkably successful in maintaining their connection with a loyal customer base in more than 70 supermarkets, food cooperatives, and food service establishments. Thousand Hills Cattle Company markets grass-fed beef produced by 40 farmers in Minnesota and the surrounding states and processed by Lorentz Meats in Cannon Falls, Minn. Their marketing information stresses health benefits and sustainable production practices along with the local origin of their product. They offer open house tours of production and processing facilities that give customers from more than 60 local stores a chance to see how grass-fed beef is produced, and they have a select group of producers who do regular in-store tastings that establish direct connections with consumers. Fresh fruits and vegetables are often not branded and pose a more difficult challenge for establishing strong linkages between consumers and producers. Some retailers use point-of-purchase materials such as large producer photographs or special signage to identify local products, but the information these convey can be unreliable when suppliers change more rapidly than point of sale information. In contrast, Red Tomato, a nonprofit organization that markets fresh produce throughout the Northeast for more than 35 farms has been successful in creating a sense of connection between consumers and producers that carries through wholesale and retail intermediaries. Their website tag line—“Trust the farmer. Know the farm. Love the tomato.”—captures the essence of their strategy, which combines farm identity preservation with a strong overall brand identity. Local products enter mainstream distribution channels through broad line distribution centers, direct store delivery, and specialty distributors. Supplying adequate volumes is the key challenge for products that reach stores through broad line distribution centers for at least two reasons. First, distribution centers prefer large volumes of products from a relatively small number of suppliers to benefit from economies of scale in distribution. Second, this channel can be expensive for suppliers because they are often required to participate in “push” promotion strategies, or trade promotions, including payments for space, off-invoice allowances, and contributions to marketing development funds. These promotions generally favor large suppliers with significant marketing budgets (Gómez, Rao, and McLaughlin, 2007). Direct store delivery offers local food product suppliers greater flexibility in choosing the stores they serve, but delivery costs can be substantial when retail outlets are spatially dispersed, and transaction costs can be high when multiple approved supplier arrangements must be negotiated and when order entry and invoicing must be done for each store. Both Cedar Summit Farm and Thousand Hills Cattle Company rely primarily on direct store delivery. Specialty distributors may be an easier entry point to mainstream channels for many local food products. They typically carry a more narrow line of products than broad line distributors and often have less onerous service requirements. Co-op Partners Warehouse is an example of such a business. Specializing in “… organic produce, dairy, soy and juice servicing retail co-ops, natural food stores and restaurants in the Upper Midwest,” they offer drop-ship services for local producers that allow their products to be transported along with regular orders to retail stores and restaurants. This makes much more efficient use of transportation resources and lowers costs. Both Cedar Summit Farm and Thousand Hills Cattle Company use this service for some of their retail store and restaurant customers that are served by Co-op Partners Warehouse. Several national supermarket chains—including Walmart and Whole Foods Market – have initiated efforts to source and sell local foods. Walmart features locally grown produce, and, according to its website, 20% of the fresh fruits and vegetables available during the summer months are produced in-state. The company asserts that these local sourcing efforts are yielding not only cost savings but also environmental benefits and positive impacts on local economies. Whole Foods has developed explicit guidelines for defining “local” in each of its distribution regions, and their web site lists local vendors by region. Whole Foods has also instituted a “Local Producer Loan Program” designed to foster growth in the supply of local food products. Regional chains also have embraced procurement from local farms. One notable example is Wegmans, a self-distributing supermarket company with over 70 stores in New York, New Jersey, Maryland, Pennsylvania and Virginia. Twenty years ago they started a “Locally Grown Produce” program, which now lists more than 1,200 local grower-suppliers of fruits and vegetables. According to the company web site, local products delivered directly from family farms to stores account for about 30% of produce sales in a typical Wegmans store when local products are in-season. Local growers are actively promoted in the store and occasionally do in-store tastings. Wegmans also employs its web site to communicate local product availability and to feature family farms participating in the locally grown program. In each market area, program coordinators, produce managers and local growers meet during the winter season to plan the assortment and volume of local products for the following summer season. Wegmans has a company-wide electronic system to manage local procurement, which store managers use to place orders with local farms. Local growers normally deliver product one day after an order is placed. The store transmits an invoice to headquarters upon delivery and inspection of the product, and the farmer receives payment directly from headquarters. The share of local products in total produce sales is used as a measure of store performance and the store manager has some flexibility regarding the prices paid to local growers. Independent stores and smaller chains often have even greater flexibility in sourcing local products and in communicating information about them to consumers. For example, Balls Food Stores, which operates 12 Hen House Markets and 17 Price Chopper stores in the Kansas City area, has established a close, long-term relationship with Good Natured Family Farms, an alliance of more than 100 farms within 200 miles of Kansas City, to source locally produced meat, poultry products, dairy products, and produce. This model is described in a two-part case study that documents strategies and key innovations from the perspective of each of the two business organizations (Dreier and Taheri, 2008 and 2009). One key to success has been movement of products supplied by Good Natured Family Farms through the central warehouse operated by Balls Food Stores. This required some modifications in quality, sorting, and packing standards for products leaving farms and in warehouse operating practices, but it has resulted in cost savings that can be shared by the two parties. Despite the success of the alliance between Balls Food Stores and Good Natured Family Farms, sales of local products sourced through it were less than 2% of annual store sales in 2008 (Dreier and Taheri, 2009, p. 8). This supply chain model is still developing, and the share of sales for locally sourced products would be much higher if one only considered fresh produce and meat, which represent approximately 25% of sales in a typical supermarket. Nevertheless, this raises the question of what is the potential for a significant “relocalization” of product offerings in mainstream supermarkets. Ultimately, the answer to this question will depend on the dynamics of supply and demand. On the supply side, significant growth in the share of sales for local foods can only be achieved if producers are able to supply competitively priced products with consistent quality in volumes that match supermarket product movement. Typically, this will require aggregation of product across producers—either through an entrepreneurial food company like Thousand Hills Cattle Company or through a network of producers like Good Natured Family Farms. Along with the challenge of reaching adequate production volumes, access to processing and packing services at a competitive cost is a critical issue. Economies of size in processing differ dramatically across products. Produce sorting and packing lines can operate relatively efficiently at small scales, while large, highly automated hog and cattle slaughter plants have significant cost advantages over smaller plants. When there are important economies of size in processing, some regions simply may not be able to supply the volume of product required to justify construction of processing facilities that operate at the minimum efficient scale. Smaller, less efficient processing plants may be available, but these raise product costs. When this is the case, local products will only be offered in mainstream retail outlets if they have attributes for which consumers are willing to pay a premium and they are likely to fill a niche rather than have a dominant position within a product category. 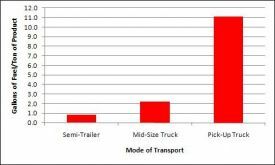 Efficient use of transportation is also an important challenge in the development of local food supply chains. Figure 1 illustrates the cost and environmental advantage of being able to ship product efficiently. It compares fuel use per ton of product for a 100 mile shipment under three transportation options: a semi-trailer hauling 40,000 pounds with a fuel economy of 6.0 mpg, a mid-size truck hauling 10,000 pounds with a fuel economy of 9.0 mpg, and a pick-up truck hauling 1,000 pounds with a fuel economy of 18 mpg. The large capacity of the semi-trailer more than makes up for its inferior fuel economy relative to the other two transportation options. Holding fuel use per unit of product constant and using the pick-up truck as a baseline, product can be transported five times farther by mid-sized truck and more than 13 times farther by semi-trailer. Even if fuel prices increase significantly, then, local food supply chains will only be able to achieve a distinct cost and environmental advantage associated with transportation if they can reach efficient scale. This can be accomplished, but it will likely require collaboration among producers and further innovation in the development of localized distribution systems. On the demand side, it is not clear how rapidly consumer demand for local products will grow or how sensitive it will be to price premiums that may be required to stimulate expansion of supplies. Significant price premiums may limit sales to purchases by a relatively narrow base of dedicated “locavores” who place a high value on local origin. Without truly unique attributes that are valued by a broad segment of consumers, it may be difficult for a local product to emerge from a niche position within a product category. When this is the case, producers may find it more profitable to distribute their product over a wider area rather than growing the local market. For example, shipments to high-end markets on the east and west coast are important enough for niche pork producers in Iowa that they identified shared transportation for less-than-a-load long hauls as a high priority area for collaboration (Wilkinson, 2007). Growing interest in local foods stems, at least in part, from the belief that a shift to more local foods can address concerns about the economic, environmental, and social performance of the food system. However, impacts of local foods on food system performance are complex, difficult to measure, and sometimes unexpected. This makes it hard to justify “relocalization” as a simple end in itself. Sales likely will grow for local food products that have cost advantages or unique quality attributes that consumers value. Otherwise, it will be difficult for local foods to capture a significantly larger share of supermarket offerings in the near future. Nevertheless, the examples presented here demonstrate that there are promising opportunities for local foods to become more readily available in mainstream supermarkets. Growing entrepreneurial attention to opportunities in this segment of the food system and increased public funding for research on local foods are likely to yield increased efficiencies and improved product quality. Research can also improve understanding of potential public benefits from local food systems associated with factors such as increased civic engagement, growth in local economic activity, and the public health impacts of diets that include more fresh foods. Starting from a small base, like organics a decade ago, this segment of the food system has the potential to enjoy sustained, rapid growth. There is much that producers and mainstream retailers can do together to respond to consumer demand for local products. These responses can yield solutions that simultaneously benefit producers, retailers, and consumers. Gómez, M.I, V.R. Rao, and McLaughlin, E.W. (2007). Depth and allocation of trade promotions: Evidence from the U.S. supermarket industry. Journal of Marketing Research, 44(3), 410-424. Robert P. King (rking@umn.edu) is Professor, Department of Applied Economics, University of Minnesota, St. Paul, Minnesota. Miguel I. G�mez (mig7@cornell.edu) is Assistant Professor, Department of Applied Economics and Management, Cornell University, Ithaca, New York. Gigi DiGiacomo (bolv0001@umn.edu) is Research Fellow, Department of Applied Economics, University of Minnesota, St. Paul, Minnesota.